Cute home in Sought after Dale School District with easy access to I-40, HWY 102, Grand Casino & I-40. This 3 bedroom home is waiting for you to put your mark on it. The 2 car garage has been partially converted but could be easily returned to a functional garage OR finish the conversion to a family room or even a master bed and bath. The home has original wood floors that could be refinished to their former glory. The refrigerator will stay with an acceptable offer. Out side is a 2 car carport and in the backyard another carport that will accommodate an RV. There is an enormous dry cellar under the back patio for those lovely Oklahoma tornadoes! 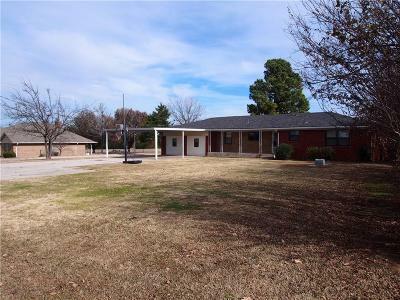 The home is situated on 1 acre some of which is fenced to accommodate pets and the remaining yard behind the home is cleared and could be the location of your family gatherings.